MacGuard now, unlike its earlier avatar MacDefender, does not require a password for installation and makes parts of the current Mac Defender prevention plan from Apple obsolete and ineffective. The new variant comes in two parts. The first part is a downloader tool that, after installation, downloads a payload from a web server. 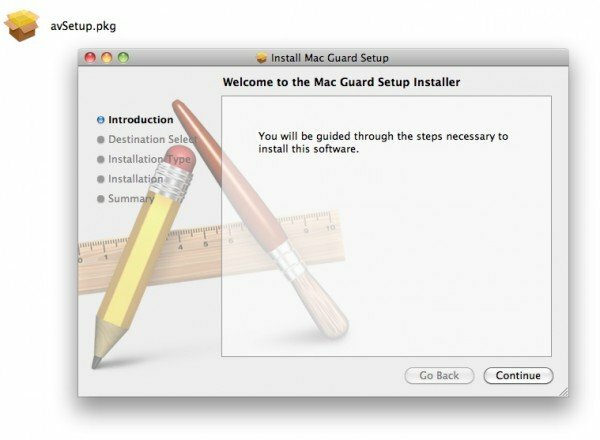 The second part of the malware is a new version of the MacDefender application called MacGuard, reports Intego. a company which specializes in providing security software for the Apple Mac computer. Seeing a potentially growing market for Mac security products, it also provides a paid antivirus software for Mac computers, unlike Sophos, which provides a free antivirus software for Mac. Unlike the previous avatar, this evolved rogue does not require an administrator’s password. Since any user with an administrator’s account – the default if there is just one user on a Mac – can install software in the Applications folder, a password is not needed. To-date a typical Mac user was safe in his/her belief that he was always safe, but now that belief could come crumbling down, any time soon. The never-ending anti-malware war seems to be just beginning for Apple, and this is bound to create marketing head-aches for Apple, who did all it could do to shout out from roof-tops that a Mac computer was secure, unlike a Windows computer. I am sure this all must be rather embarassing for Apple, but it has to realize that this is the price it will have to pay for an increasing market share. You know, I read this and I get just the slightest touch of schadenfreude for all those Mac-users who have so pointedly posted, often on sites with ‘Windows’ in their name, “you should get a Mac, we don’t get viruses”. Unfortunately, it’s almost certain to increase the numbers of Linux users pointing and laughing at the rest of us.